This is the only edition of this book that reproduces the stories as they appeared in the Strand magazine, allowing today’s reader to experience these stories in the same way their earliest readers did. As this fantasy book begins, two children have finished performing bits of Shakespeare’s “Midsummer’ Night’s Dream” and meet Puck on Pook’s Hill, which was originally named Puck’s Hill. Puck tells the children he is “the oldest Old Thing in England,” and he entertains them with stories about English history, which he magically plucks characters out of history to tell. The stories range from Roman times to the fifteenth century. The combination of history and fantasy has made this book a beloved favorite of both children and adults since it was first published in 1906. In 1907, he won the Nobel Prize in Literature, the first writer in the English language to receive the prize. 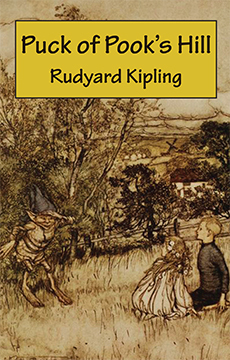 In addition to facsimiles of the stories as they were published in The Strand, with illustrations by Claude Allen Shepperson, this edition contains poems that Kipling added when Puck of Pook’s Hill was published in book form.